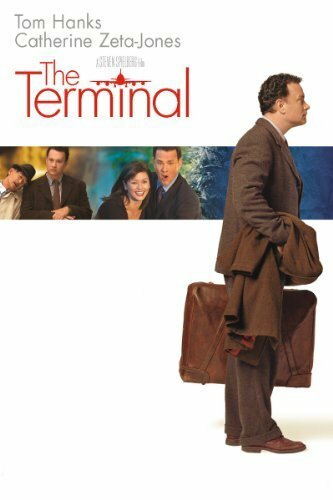 The Terminal starring Tom Hanks is definitely one of the best all time movies from my perspective. Let's do a short summary shall we ? Tom Hanks acted as a guy named Viktor Navorski from a country Krakozhia. When he reached JFK airport in New York , he was detained by the airport authorities because his passport was no longer valid. It seems that during his flight from Krakozhia to New York , his country was undergoing a war by rebellions and his country was no longer recognizable by the United States. Therefore , he was not allowed to return home to Krakozhia and banned from stepping one foot on to American soil. The solution ? He lived at the airport at Gate 67 which was still in construction and not in use. His money was not good there so he had too find a job within the confinement of the airport. After accidentally doing a construction work in the airport , he was hired by one of the airport crews and paid 19$ an hour. Along his journey , he made some friends that helped each other which included an old Indian janitor , food cart driver and a postman. Not only that , he found the love of his life named Amelia Warren which served as a stewardess. Although , his love life with her was very complicated as she was dating an older guy but at the same time likes Viktor. After almost a year living in the airport without any freedom to step outside of the building , the war in his country was finally over and he was allowed to return home. Oppositely , he chose to go to New York for a day before returning home. There was only one reason he would go through this journey. All for just an autograph of a saxophone player. Would I watch this material again ? Definitely over and over again ! The main reason is of the moral sacrifice . He was willing to go a journey of heart broken , insults , hunger , thirst and risk of losing his dignity just because of a promise. You see , his father was a great fan of jazz after staring at a picture full of jazz musicians in a Bulgarian newspaper. Then , his father wrote a letter to every one of them asking for a signature. His father waited days , weeks , months , years. He waited for 40 years. Finally , he got the response from them but only one person , Benny Golson. He died before getting it. Hence , Viktor made a promise to his father that he would fine the famous saxophone player to complete the autograph collection. This clearly showed a heart that is so sincere and determined in fulfilling his father's promise. I literally cried the first time I watched this movie. Definitely recommended for you guys !